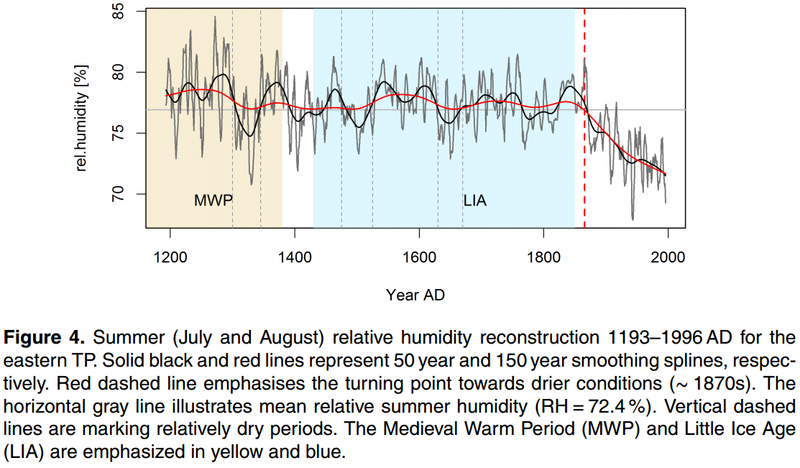 We identified more moist conditions at the termination of the Medieval Warm Period, an oscillating air humidity around the mean during the Little Ice Age and a sudden decrease of relative humidity since the 1870s. We agree with the conclusions of Xu et al. (2012) who associate the humidity decline to the decrease of the thermal gradient between the tropical and north Indian Ocean, caused by the reduction of the land-ocean temperature difference. However, the reasons for the temperature contrast reduction are not sufficiently clarified. Lau et al. (2006) attributed the humidity reduction to the increase of greenhouse gas and aerosol emissions, while Duan et al. (2000) discovered a relationship to solar activity. The beginning of the humidity decline precedes the onset of Asia’s industrialization and therewith massive aerosol emissions. Thus, solar activity and an accompanied temperature increase seems more plausible to regulate the northern hemispheric temperatures and therewith the thermal land-ocean contrast. 1. They suggest the Northern Hemisphere temperature increase since the end of the Little Ice Age in ~1850 was driven by accumulated solar energy, not man-made greenhouse gases. 2. Climate models make the simplistic assumption that a warming climate will cause an increase in specific humidity while relative humidity remains constant. However, the reconstruction in this paper and observations from several other papers have shown this assumption to be false, falsifying this critical assumption of climate models upon which amplified positive feedback from water vapor is based. Instead of remaining constant, relative humidity has decreased to offset the increase in specific humidity with warming. This is as predicted by Miskolczi's theory of a saturated greenhouse effect and implies that additional increases in greenhouse gases will not cause additional global warming. Abstract. We present an 800 years long δ18O chronology from the eastern part of the Tibetan Plateau (TP). The chronology dates back to 1193 AD and was sampled in 1996 AD from living Juniperus tibetica trees. The chronology is unique for eastern Tibet and provides a reliable archive for hydroclimatic reconstructions. Highly significant correlations were obtained with air moisture (relative humidity, vapour pressure and precipitation) during the summer season. We applied a linear transfer model to reconstruct the summer season relative humidity variation over the past 800 years. We identified more moist conditions at the termination of the Medieval Warm Period, an oscillating air humidity around the mean during the Little Ice Age and a sudden decrease of relative humidity since the 1870s. The late 19th century humidity decrease is in good accordance with several multiproxy hydroclimate reconstructions for south Tibet. On the other hand, since the end of the 19th century strong evidences for an increase in humidity on the northern TP is exhibited. Spatial correlation analysis with the North Atlantic Oscillation index (NAO) and the sea surface temperature (SST) of Niño region 3.4 reveal a weak and nonstationary relationship to the δ18O chronology. Instead, spatial correlations expose a dominating convective influence to the relative humidity reconstruction. Furthermore, wavelength analysis reveal good agreements between the significant cyclicities in our δ18O chronology and several moisture sensitive proxy archives. If this reduction in humidity since 1870 is confirmed, then the increase in CO2 will someday be recognized for having made possible the increase in plant growth documented during the last 60 years. Increased CO2 allows plants to synthesized more food with smaller stomata (pores) through which plants breathe and feed. This is because less water is lost in the process. Technically, during evapotranspiration related to photosynthesis, less water is lost and so less is needed for plant growth. This has been demonstrated globally with satellite date processed to show the NDVI (Normalized Difference Vegetation Index). Global maps show net greening of forests and grasslands worldwide. It may be inferred that the oceans have greened also resulting in more food for marine life.